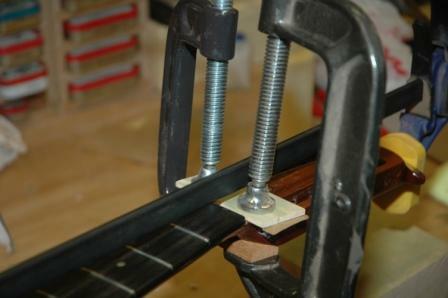 Working on jigs and workboards today. 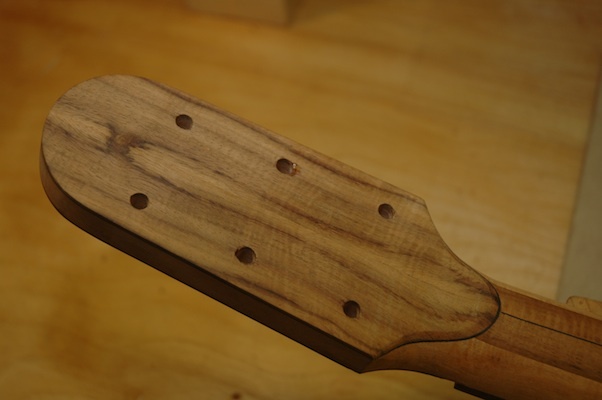 I’ve decided to create a neck shaping jig, simply a platform to clamp the neck to so I can stick it in the vise and have clearance to shape the backside of the neck and heel. 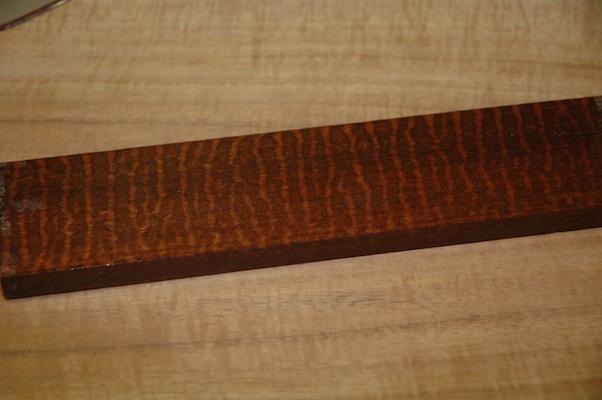 I’ve continued to fine tune the Hybrid workboard. 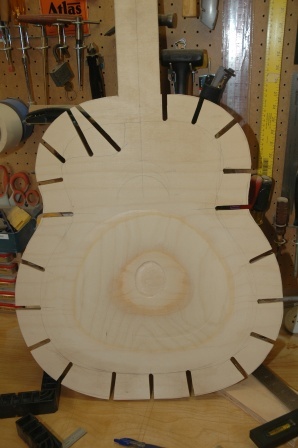 First step was to hollow out the surface to a 28′ radius to compensate for the bridge area bulge. 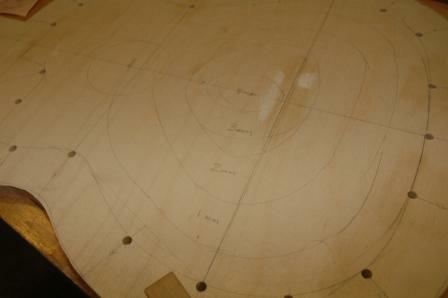 I marked a few elevation lines as guides. 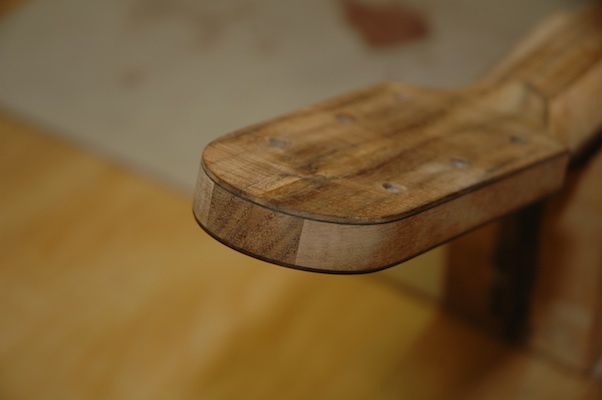 I used a router with a rounded bit set to 4mm depth for the center, then dropping 1mm for each of the next elevation lines until the final shelf was routed to a depth of 1mm. 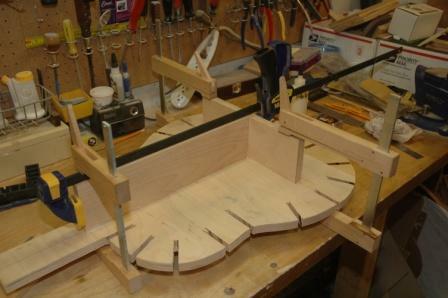 I used the table saw to complete the slots from the edges in toward the center where the dowel clamps go. 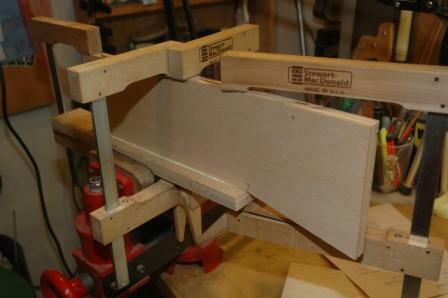 Finally, a tripod stand was mounted to the back for resting on the workbench or clamping into the vise. 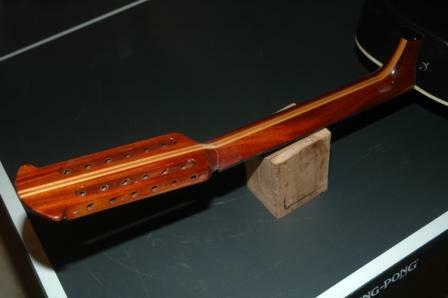 The neck clamp has been removed and the glue squeeze out sanded away. 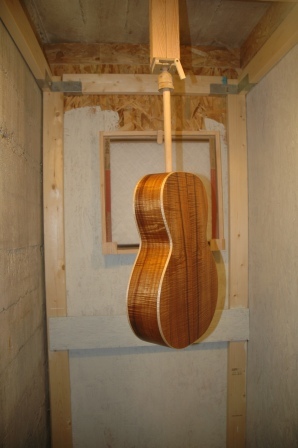 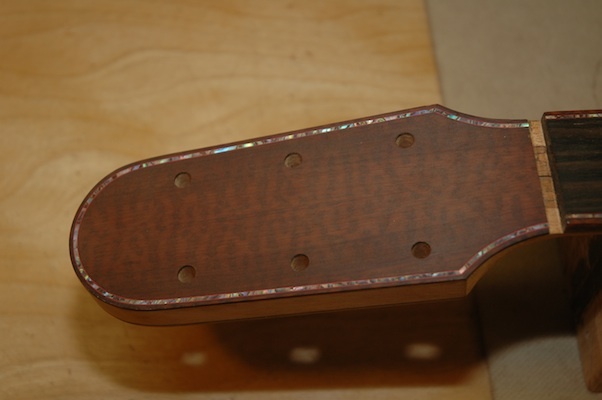 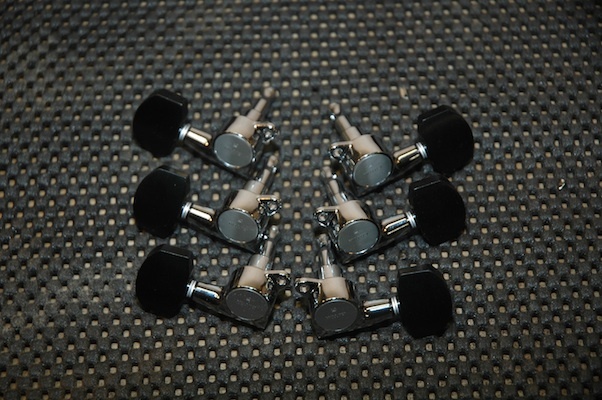 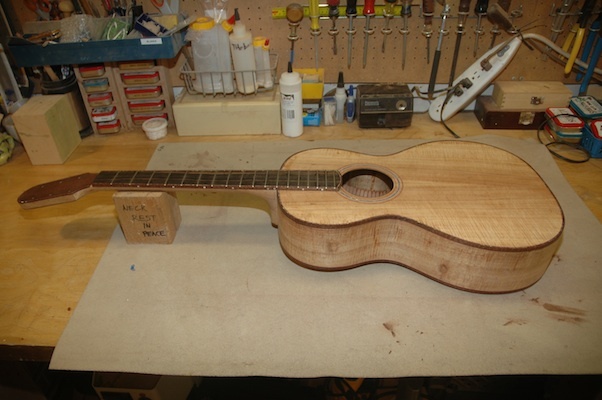 The finish is wonky on the face of the headstock and will require extensive filling. 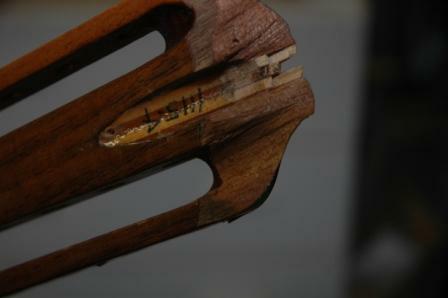 The crack is visible on the backside due to stress of the finish pulling away from the surface. 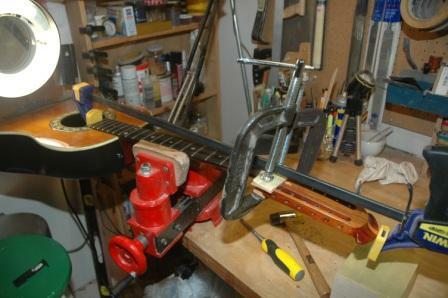 If the customer wants, I can stop here and restring. 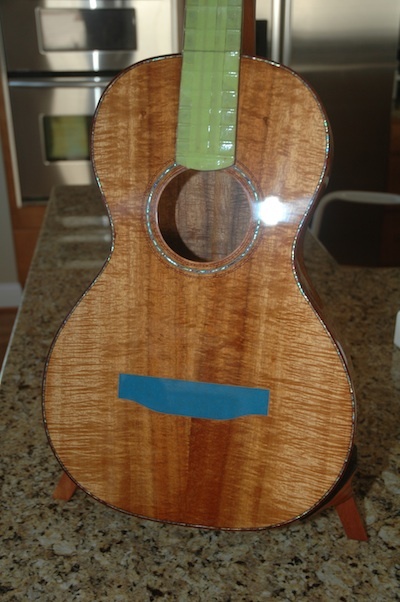 To complete refinishing and buffing and polishing will take another two weeks due to curing time. 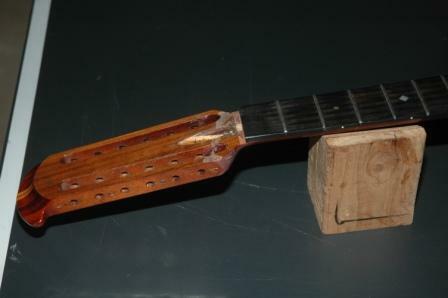 A colleague has requested a repair of his 12-string Ovation which has the sad malady of a severed head. 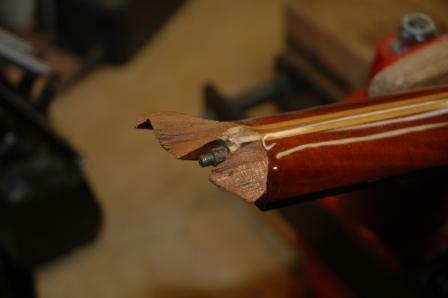 Fortunately, the break was clean, along grain, and in a location which will be easy to clamp. 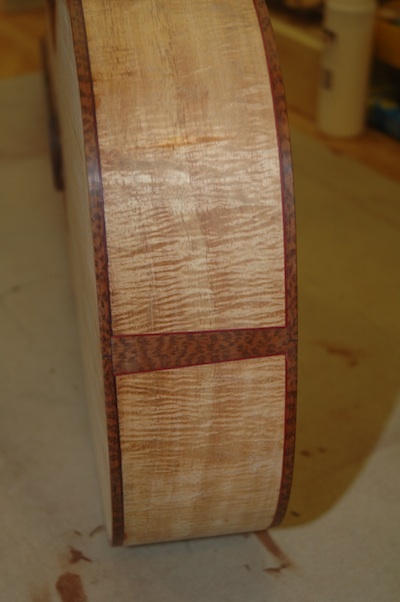 A bit of cleanup on the center lamination, then a dry fit clamping to test crack closure before gluing up and clamping to set overnight. 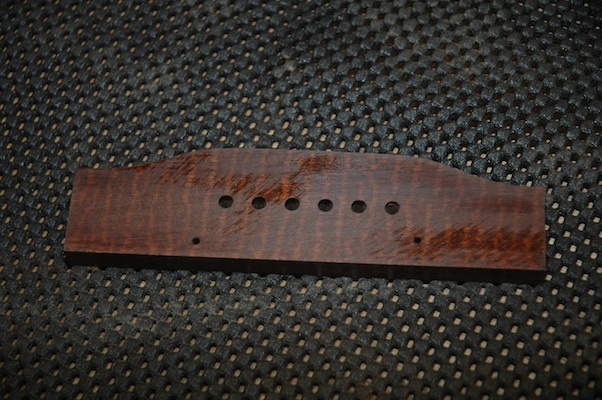 The time consuming portion of this repair will be in cleaning up the finish and filling the gaps. 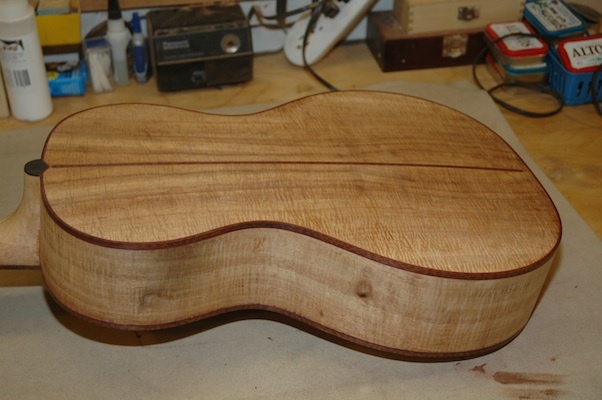 Still it should come in well under the estimate. 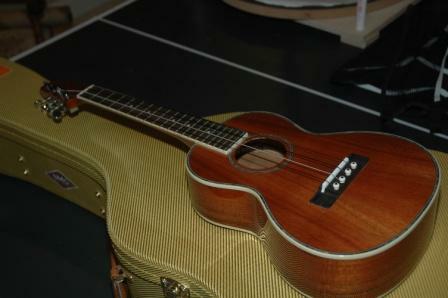 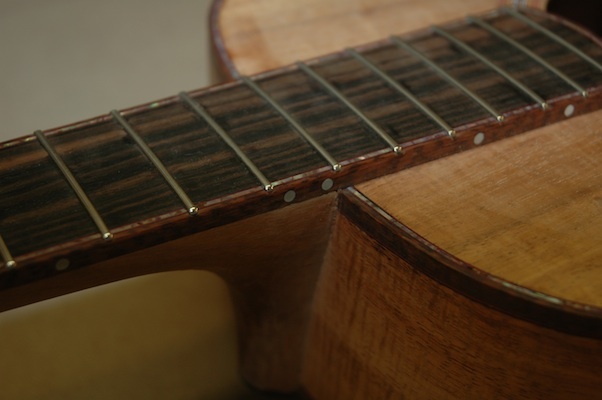 I’ve completed the bridge install for the “Fender” Uke. 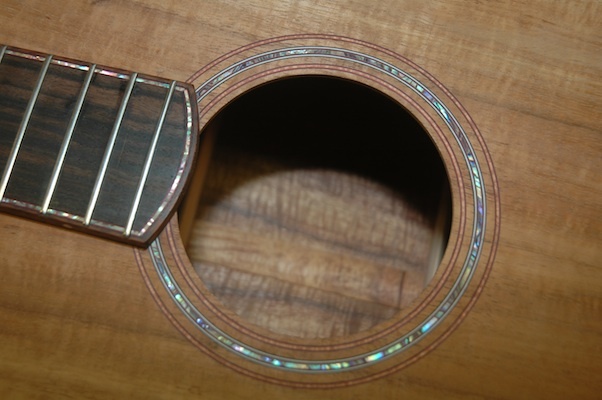 The experiment with using beads as string ends worked well. 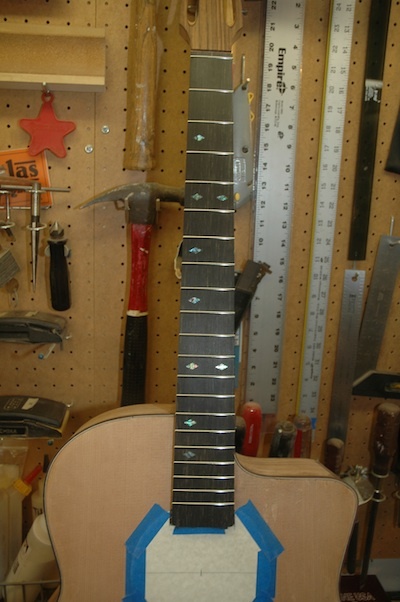 The strings are now fully stretched and stay in tune, and the intonation is quite fine, indicating I mounted the bridge properly. 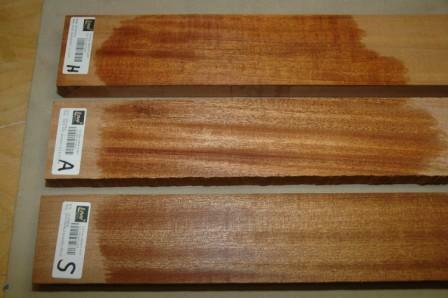 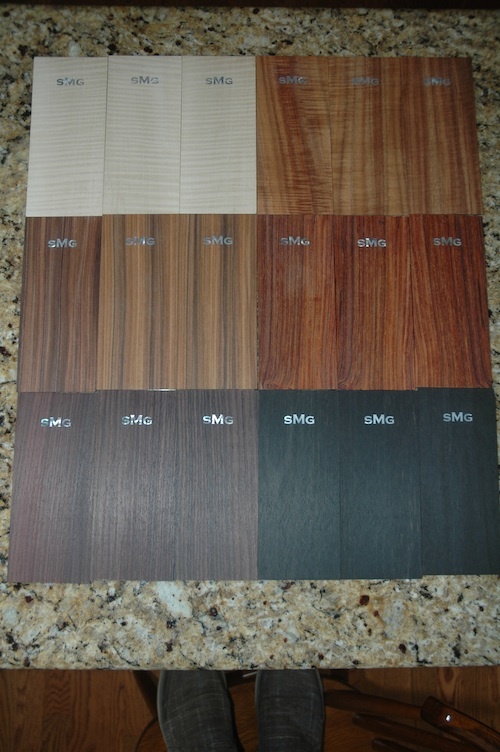 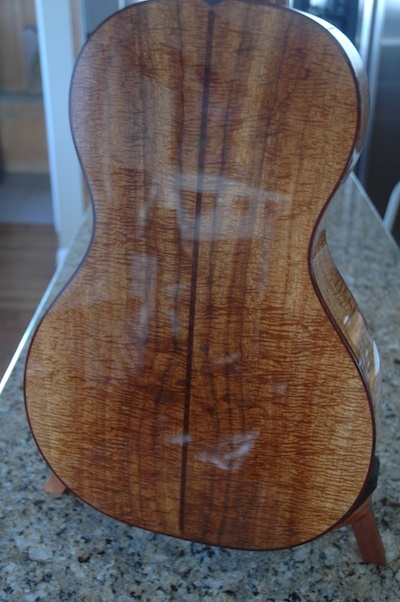 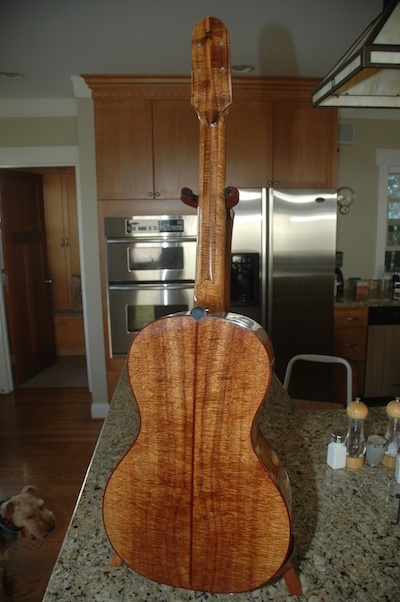 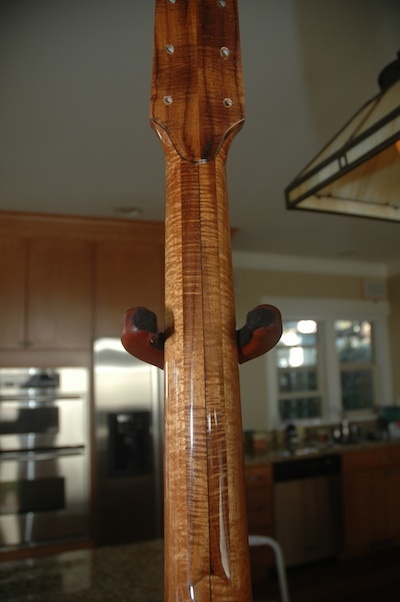 I ordered three different mahogany neck blanks to see them side by side and hopefully arrive at a favorite. 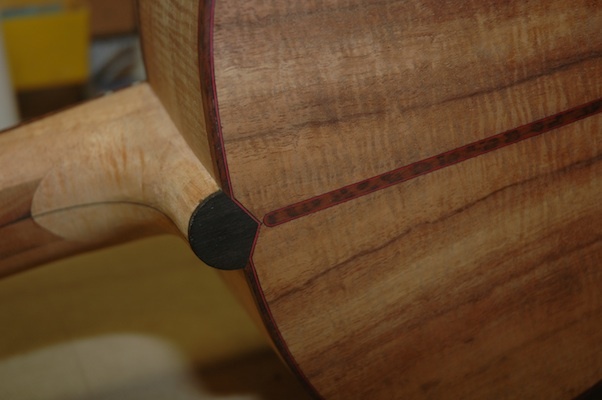 From top to bottom: Honduran, African and Sapele.